ES: intervalo, I: intervallo, F: intervalle, D: Intervall, NL: interval, DK: interval, S: intervall, FI: intervalli, kahden sävelen korkeusero. Difference in pitch between two notes. 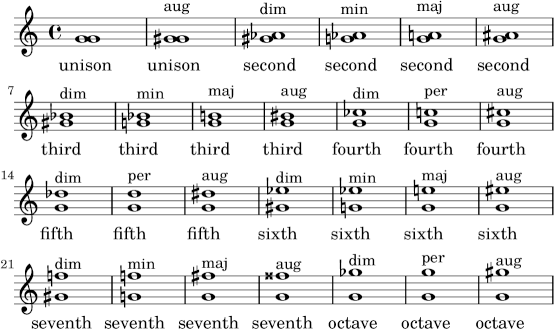 Intervals may be diminished, minor, perfect, major, or augmented. The augmented fourth and the diminished fifth are identical (or enharmonic) on an equal-tempered twelve-tone scale and are called tritonus because they consist of three whole tones. The addition of such two intervals forms an octave.